At Social Tables, we don’t think your diagram is complete until every attendee is accounted for. That’s why we give you the power find your attendees and to get to know important event-day information about them with the wave of a mouse! 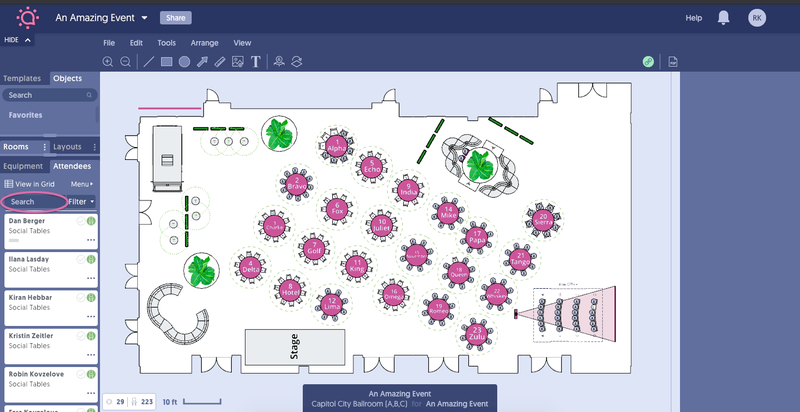 To begin, press on the Menu button on the left panel which allows robust diagram view options such as toggling meals, tags, table numbers and guest names. You can take another route if you want. Simply hover your mouse over any of the occupied chairs in your diagram. A popover of useful information—such as meal and dietary tags—will appear. Additionally, you can search for guests using the search bar located at the top of the Guests tab on your diagram. Log into Social Tables now, because you should have all the information you want about your event's attendees!